Off the western edge of Ireland’s Connemara District, land gives way to the mighty Atlantic Ocean, but only begrudgingly, as there are islands dotting the coastline that continue to resist the incessant will of the waves. Three in particular, Inishbofin, Inishturk and Clare Island, are inhabited (although barely), and accessible only by ferries or private boats. These out-of-the-way parts of the Emerald Isle are a step back from the complications of modern life accentuated by the chance to explore the rugged western Irish coast. Just a little over six square miles in size, Inishbofin still seems roomy — perhaps because its population is less than 200 people, although there are many more sheep. Located five miles off the coast of County Galway, it’s distant yet inviting. Its wide open, rolling land makes Inishbofin a magnet for hikers. I took a good “stretch ‘o the legs” heading west from the island’s harbor — which, for history buffs, is guarded by the remains of a stone fort built on Oliver Cromwell’s orders in 1656. Paved and gravel roads quickly faded into grassy paths that can be followed — or not. The island’s curve led me to the north shore, where the ocean’s ongoing effort to take back Ireland has created a stark, beautiful landscape of steep cliffs, rocky grottos and majestic sea arches. 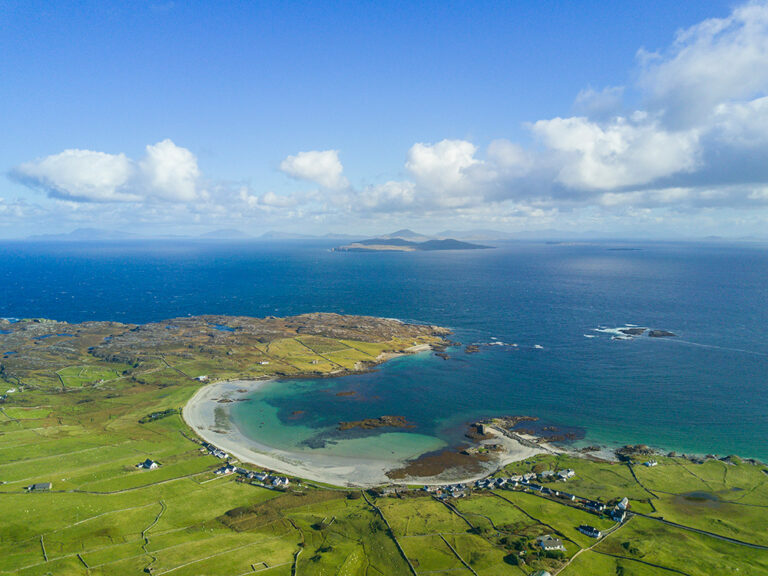 Inishbofin is a popular destination for day-trippers, but overnight accommodations are available and certainly worth considering. I stayed at the Doonmore Hotel (which you can book at AAA.com/Travel). After a day of exploring the island, it didn’t take me long to find its pub, which, in addition to having a welcomed range of, shall we say, imbibements, featured traditional Irish music skillfully played by locals who pleasantly persisted deep into the evening. Rising over the Atlantic a few miles to the northeast of Inishbofin, this island, while smaller, still offers plenty of outdoor fun. And solitude. Only about 60 hardy Irishmen call Inishturk home. As on Inishbofin, offshore fishing and scuba diving services are available, but hiking attracts many visitors to Inishturk. There are two marked trails, with the Lough Coolaknick Loop being the easier. The hour-and-a-half walk took me into the sloping, sheep-dotted hills of the island’s interior and out to the open spaces of its eastern shore. The Mountain Common Loop to the west is about an hour longer and much steeper. On the northern side of Inishturk, in addition to enjoying stunning views from its cliffs, I reached the remains of an abandoned stone signal tower. Located at about 700 feet above sea level — the highest point on the island — it was a station built in the early 1800s to watch for any major mischief from Napoleon’s navy. Since this island is easy to enjoy — making it hard to leave after just one day —for lingerers, there are B&Bs available to extend the experience. I spent a night at the Teach Abhainn B&B. To the northeast of Inishturk is Clare Island, where history runs deep, as I discovered when my ferry pulled into its harbor. Overlooking the dock is a silent sentinel, the stone ghost of a castle that was once the stronghold of Ireland’s famed “pirate queen” Grace O’Malley in the 16th century. A little over a mile to the west on the island’s southern hiking trail, my time trek continued while I explored the well-preserved St. Brigid’s Abbey, which dates back to the 12th/13th century. Although faded, mysterious paintings of animals, warriors, dragons and other symbols can still be seen on its ceiling. I also hunted for the remains of ancient promontory forts scattered across the island, and some took a bit of searching to spot, but one other historical feature, the Clare Island Lighthouse, was an easy find. Built on towering, scenic cliffs in 1818, it was taken out of service in 1965, but not out of action. Today, it’s an upscale guesthouse. There are other guesthouses, as well as B&Bs, on Clare Island, any of which can accommodate visitors looking to further their outdoor adventures in the outback of the beauty that is western Ireland’s lands’ end. The Inishbofin ferry departs from the town of Cleggan in County Galway on the Irish mainland. Inishturk can be reached on ferries from either Cleggan or Roonagh pier just to the north in County Mayo. Clare Island is served by the Roonagh Quay. From Shannon International Airport, it is a little over two hours by car to the ferry ports. Book now! 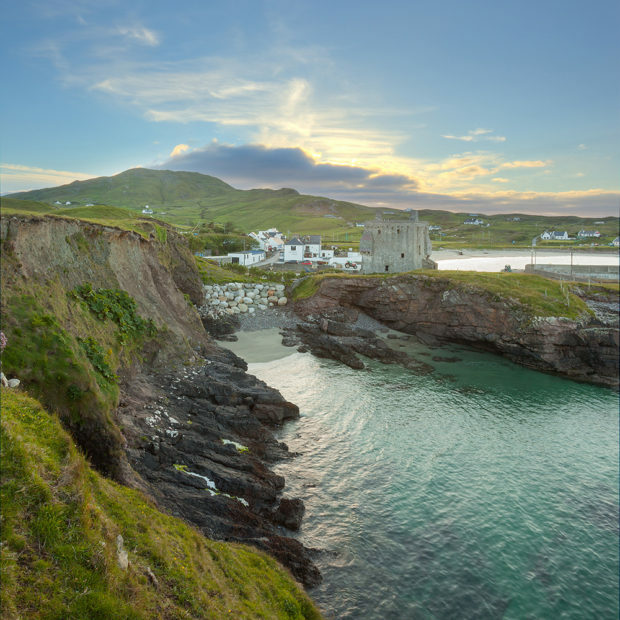 Explore the Emerald Isle with AAA preferred partner, Brendan Vacations! Your AAA Travel Agent can help you arrange an independent stay, pre- and post-tours or a customized self-drive tour. Call 800-398-0379 today!